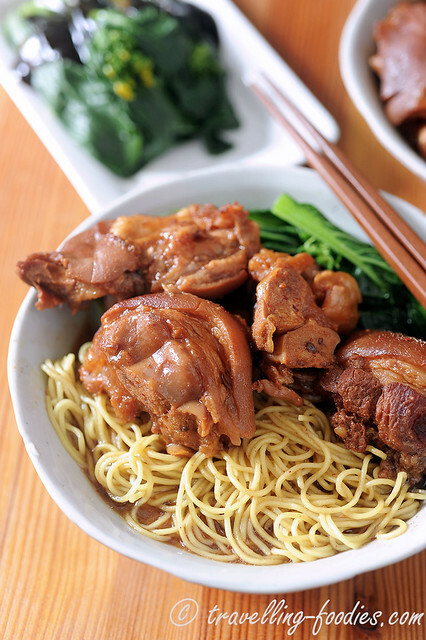 Odd it may seem, my favorite dish to order whenever I walk into a traditional chinese noodle shop in Hong Kong is not a bowl of 云吞麵 wan tan meen or 水饺麵 shuei gau meen. For years, it has always been 柱侯牛腩麵 ngau nam meen aka braised beef brisket noodes for me. Not sure why but I’d always preferred this over the popular pork or shrimp dumplings for its robust flavours and the melt-in-your-mouth bites of beef brisket as well as succulent chunks of beef tendon which had been braised to the right texture and consistency. It was until more five years ago when I first visited 劉森記 in Sham Shui Po where I found another love. Their 南乳焖猪手 Braised Pig Trotters with Nam Yu Fermented Beancurd was cooked to perfection I thought. Delightfully aromatic and with flavours which are strangely familiar and yet alien to me at the same time, it was love at first sight… or taste rather. Since then I’d been going around trying out various noodle joints not only for their 柱侯牛腩麵 but also their 猪手麵 whenever possible. 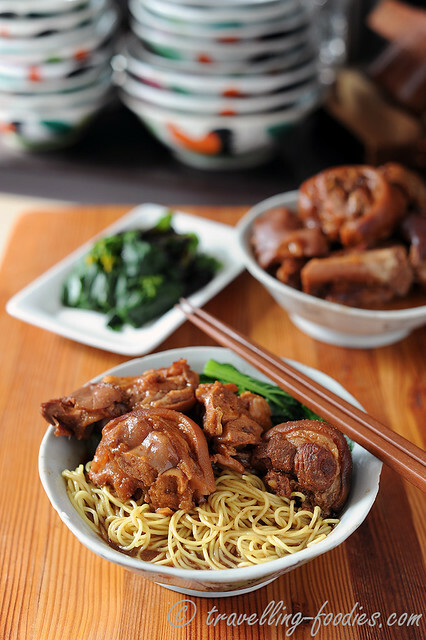 We braise pig trotters at home all the time, from 卤猪脚，the traditional dark soya sauce version which is prevalent in local Hokkien and Teochew cooking, to 猪脚醋, the richly vinegared version for the occasional indulgence of sweetness and tang. It didn’t take long for me to try and cook 南乳焖猪手 at home for myself, to satisfy my own cravings for this dish whenever I could, whenever I want. 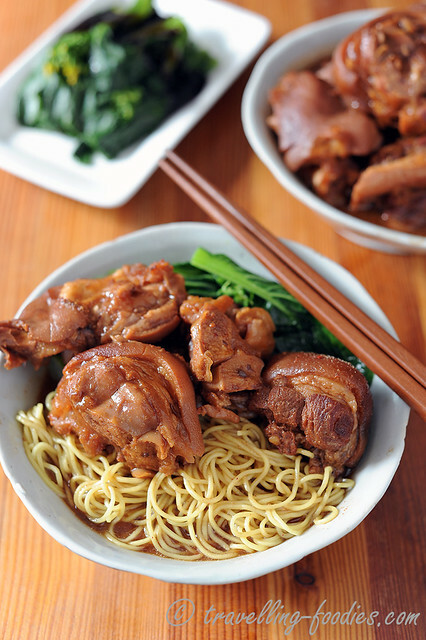 For me this is an excellent dish to accompany noodles, as the latter when it is just slightly undercooked, readily soaks up the rich juices from the braising liquids and together with it all the wonderful flavours, locking them into the yellow strands of egg noodles with every slurp and every bite. Traditionally in Hong Kong, 竹昇麵 zhuk sang meen is used where the noodles are manually prepared using a very thick bamboo pole to work the noodle dough to the right texture. It has become a dying art in Hong Kong, quite inevitably given how laborious it is to make the noodles this way via traditional means. But the results of the noodle produced are quite different from the machine-made ones I think. More springy and succulent, or in the words of the local folk, more 弹牙 “teeth-bouncing” supposedly. We can’t find zhuk sang meen in Singapore of course. Not that I know of at least. Even in Hong Kong itself there are very few, less than five to be precise who still make their noodles this way, athough there are still quite a number of such noodle-making practitioners in 顺德 Shun Tak just across the Chinese border. I’d to settle for “港式面条” Hong Kong styled noodles from the local supermarket, which are made more springy than the ones we are used to seeing in our local wan tan meen but yet in a different way which zhuk sang meen is imbued with. My mum used to braise pig trotters at home quite often not only because it is delicious but the fact that pig trotters were comparatively cheaper cuts compared to other parts. Yet, it is for me one of the most delicious parts of the animal as I’d been told long long ago by grandma, that the meat nearest to the bone often taste the best. Butchering the whole front hock at home may prove to be quite a challenge so whenever possible, I get my butcher to do the job for me. I usually braise two pig trotters each time I make this dish as it is always more flavourful by the economy of scale to cook more at one go. It is the same logic with adding pork ribs to make a soup base. Adding 500g of pork ribs to 1 litre of water does not produce the same taste as 1 kg of ribs to 2 litres of water. The latter churns out a broth which is much more gratifying without saying. So cooking sometimes is not just a mere game of ratio and proportions. More is sometimes better, though it may not be feasible given how small modern households are with not that many mouths to eat compared to the past. But this dish freezes rather well, so I would encourage folks who are interested to try making it to go bold with the portions and cook more. Freeze the surplus and enjoy them in the weeks to come! 南乳 Nam yu is essentially fermented beancurd made together a concoction of red yeast rice 红麹 from which these soft and mushy cubes obtain their characteristic coloration. The flavours are also significantly more pronounced compared with the paler 腐乳 versions. It can be an acquired taste for some but I love it! 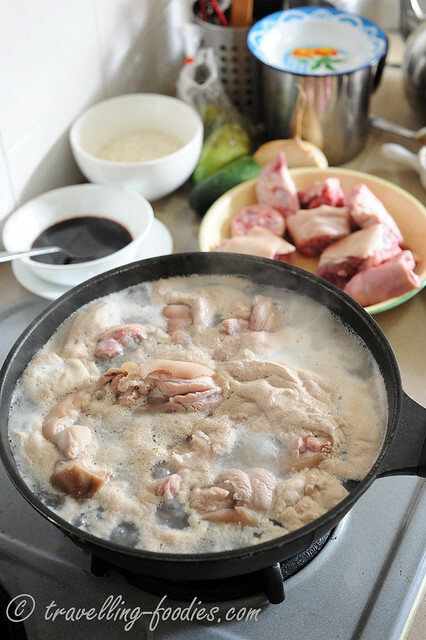 Before braising, the chunks of pig trotters have to be cooked briefly in boiling water. This is the technique which the Cantonese call “焯水” zhor shuei. Time wise, it is longer than “飞水“ fai shuei which merely scalds the ingredients for a short while. 焯水 serves to “purge” any impurities from the meat chunks, particularly blood and bone marrow which manifests as the thick layer of scum on the water surface when they are cooked. The chunks of meat are then rapidly rinsed until running water before braising. 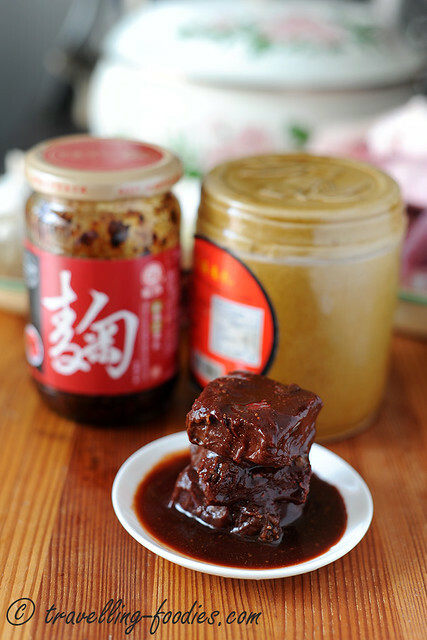 Cooking 南乳焖猪手 is a fairly straightforward process and requires far fewer ingredients compared to braising beef brisket for example. But as with most braising dishes, the principles are the same where time is an essential ingredient to the cooking process as well. Given more time for simmering, the meat chunks become more flavourful. Thankfully, pork cooks and tenderises far more quickly than beef so the dish is ready to be enjoyed in under 2 hours. But I generally like to cook it briefly once the day before and leave it overnight for flavours to mature and develop before continuing the boiling process the next day. The experience of enjoying the dish the next day proves to be much more satisfying than on the actual day of cooking itself! 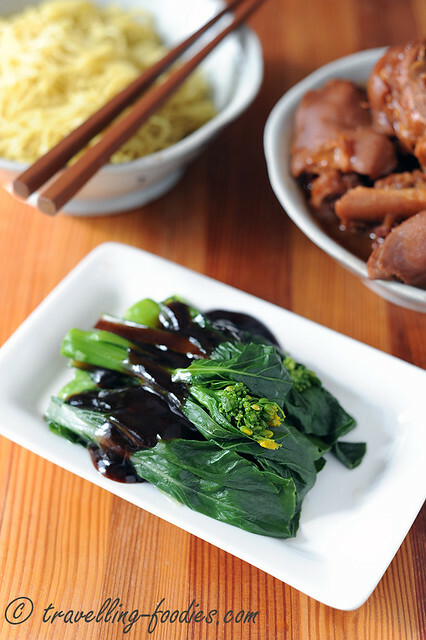 As with many Cantonese noodle dishes, a great accompaniment is simply steamed or scalded green vegetables like 芥兰 kai lan (chinese kale), 菜心 choy sum, 生菜 sang choy (lettuce) or even 小白菜 siu bak choy drizzled with oyster sauce. 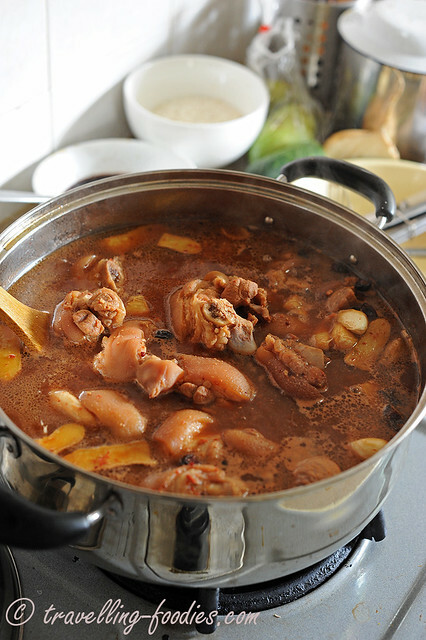 Bring a large pot of wok of water to a boil and add chunks of pig trotters into it. Maintain the water at a rapid boil at all times. Skim off the scum on the water surface. Cooking the pig trotters for about 3-5 min，in batches if necessary to avoid overcrowding the pot or wok. Meanwhile, place the fermented beancurd into a bowl, add chinese cooking wine and mash with the back of a fork to break up the cubes and form a coarse slurry. Place the pig trotters in a colander and rinse under running tap water. Be sure to remove any scum as well as hair bristles on the rind. In a large cooking vessel， add cooking oil and ginger. Gently saute the ginger slices until aromatic and slightly brown. Add star anise and cassia bark as well and saute for another half a min or so. 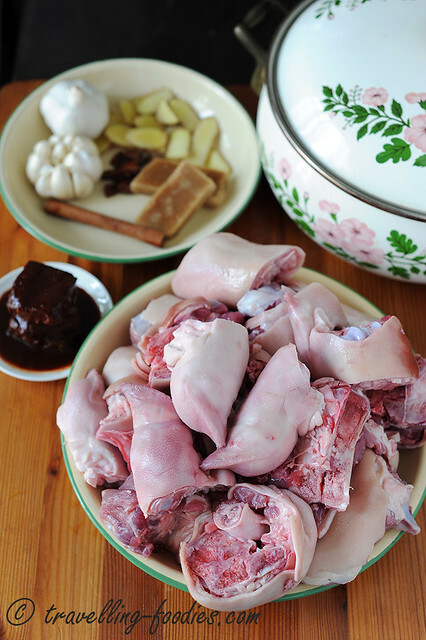 Add the chunks of pig trotters followed by the beancurd and wine mixture, tossing them slightly to coat the pig trotters with the nam yu mixture. Proceed to add all the other remaining ingredients except salt. Top up with water and bring to a rapid boil. Lower the flame, cover with lid and simmer for 30 min or so. Check the taste and add more dark soya sauce, light soya sauce, and/or unrefined sugar if necessary. Continue to simmer for another 30-45 min, or until the meat is considerably soften and the rind and collagen layers become delightfully wobbly. Check the taste again and season with salt if needed. Continue to simmer, with the lid off until the desired texture of the meat is obtained. Ideal, the pig trotters are ready when the meat just comes off the bone when nudged with a fork. Serve with blanched noodles or rice and other vegetable dishes. This entry was posted on January 10, 2014 by Alan (travellingfoodies). 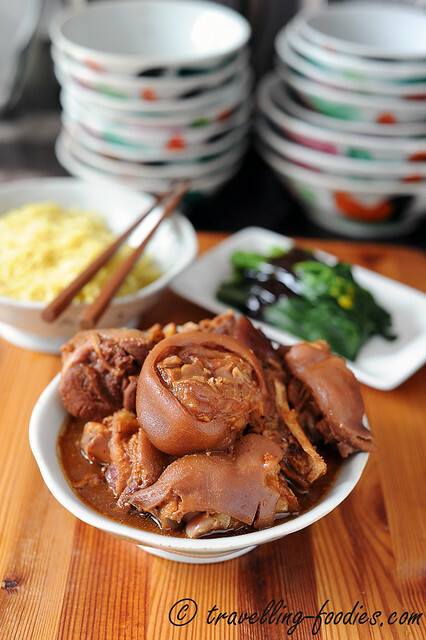 It was filed under Food, Simple Eats and was tagged with cantonese braised pig trotters, choi sum, choy sum, 猪手, 生抽, 竹昇麵, 粤式, 红麹, 红曲米, 老抽, 郊外油菜, 花雕, 菜心, 蒜, 黄酒, fermented beancurd cubes, Hong Kong, noodles, pig trotters, red yeast rice, wanton mee, 八角, 南乳, 南乳焖猪手, 姜, 桂皮, 港式. A glance at your first pic already makes me drooling…. mouth watering! Any idea any differences between the Taiwan and the China’s nam yue? I like your sixth photo ~ because I thought I could get that whole pot for myself! Beautiful photos as always! Making me hungry even though I just had lunch! What brand of nam yu are you using? Looks very different from the one I always buy to go with my porridge. And where can I get it? Thanks! the bottle on the left was what I’d used. I’d gotten it from Taiwan. The bottle on the right is 上海南乳 which I bought locally (in Singapore). But I found the Taiwanese version more aromatic and has a sweet edge to it. So I’d used that instead! Can i replace the unrefined sugar with gula melaka ? in equal amount? Thanks ! This looks really good! I just had soy sauce braised pig feet at a Chinese restaurant in Wisconsin and craving for nam yue pig feet next! You mentioned cooking briefly at first then leave it overnight and finish cooking next day. Which part of the cooking in your recipe that you stop and let it ‘rest’ overnight? Used this recipe for the first time on Chinese New Year 2019 and the overall flavour was excellent. I cooked it until about 60% cooked on New Years eve and then left it in the refrigerator overnight. The next day, I skimmed all the pork fat from the top and then resumed cooking it until nice and tender. It was great as a Chinese New Year dish. Thank you for sharing your recipe. I would give it a 5 star.